Dad was a study in contrasts. 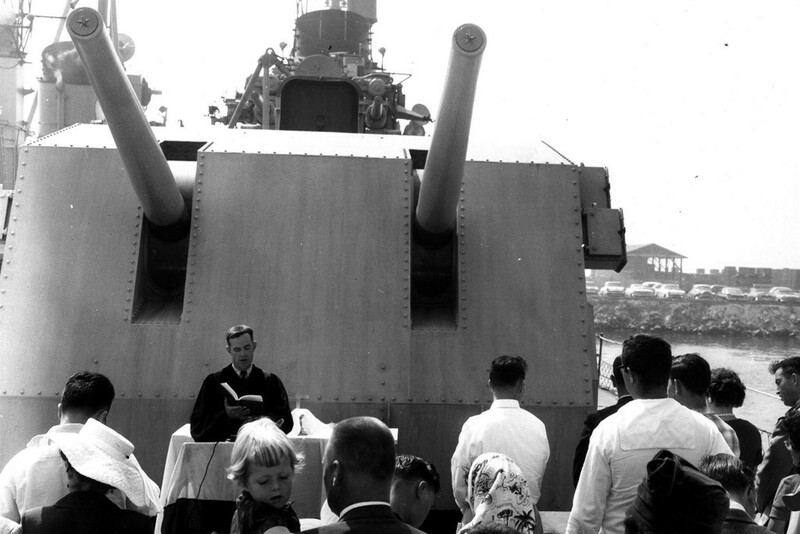 Here he preaching the word of God under the big guns on a destroyer. Taking the time to acknowledge the life of a person is the greatest honor you can bestow on another human being. We all want to be remembered. We want to have made a difference in this life. As we age to the point where we begin to contemplate our own mortality, this desire becomes more prevalent, whether talked about or not. Few people will speak up and ask for their lives to be acknowledged. However, my experience in creating stories of an individual’s or couple’s life experiences, whether in DVD, photo book or online slide shows always results in the same response – typically involving tears. Acknowledging a person’s life is not rocket science. It is only matter of showing an interest in someone’ life experiences. It is a meaningful and rewarding experience for everyone. Typically these “life reviews” are motivated by various milestones such as 50th wedding anniversaries or memorials. For Mom and Dad’s 50th anniversary, we got together and reminisced over old times. While it was great to get together it was a missed opportunity for us in that we did not really explore their lives in any detail. Since their passing, so many questions now come to mind. While we all can intellectually understand the value of acknowledging one’s life, the unfortunate reality is that our lives are just too hectic to find the time to do it. As a result many people wait too long to bestow this honor even for their parents or grandparents. Equally unfortunate, as memories fade or worse yet the parent or grandparent dies – a great opportunity for creating and preserving the family narrative slips away. Fortunately for our family, Mom and Dad anticipated that we would be interested and they developed their own written narrative about their lives. Still, they could not anticipate the direction our questions would take and as a result there is a level of regret in the form of unanswered questions that hopefully you need not experience, if it isn’t already too late. Your parents and grandparents are individuals who have had a lifetime of experiences worthy of sharing. Don’t put off engaging them in conversation about their lives, capturing what you learn into written narrative, audio recording or video tape short sessions. We’ve created OurStoriesAreUs.com to reduce the amount of time and effort and to make the process fun and entertaining. So, no more excuses! Remember, “Stories Left Untold are Legacies Gone Forever”.